These are thin, soft circles of delicious flatbread which can be food in many street stalls in Mumbai and around India. They are super soft – i can’t stress this enough! You gotta try it out! This recipe makes approximately 10 roti’s. In a large bowl, sieve the flours and mix with salt and oil. Slowly add milk (zap it for 10 secs in the microwave if you’ve taken it straight from the fridge) and mix with the flour to make a pliable dough. Add 1-2 tablespoons of water as and when needed. Cover with clingfilm/tight lid and keep aside for 1 hour. After an hour make equal shaped balls from the dough. Take out a ball and roll it into a small roti and spread a tsp of oil to this. Transfer the thinly rolled roti to the tawa and immediately you can see bubbles forming on the roti. Flip this and let the other side to cook. These actions should be quick (around 30 secs in total), otherwise it will get burnt and end up crispy instead of soft. Fold the roti it into triangles and do the repeat the same procedure for the remaining dough balls. Serve hot with your favorite side dish. My favourites with this are rajma (kidney beans) or tadka dhaal (lentil curry with tempered green chillies,mustard & cumin seeds & onions). 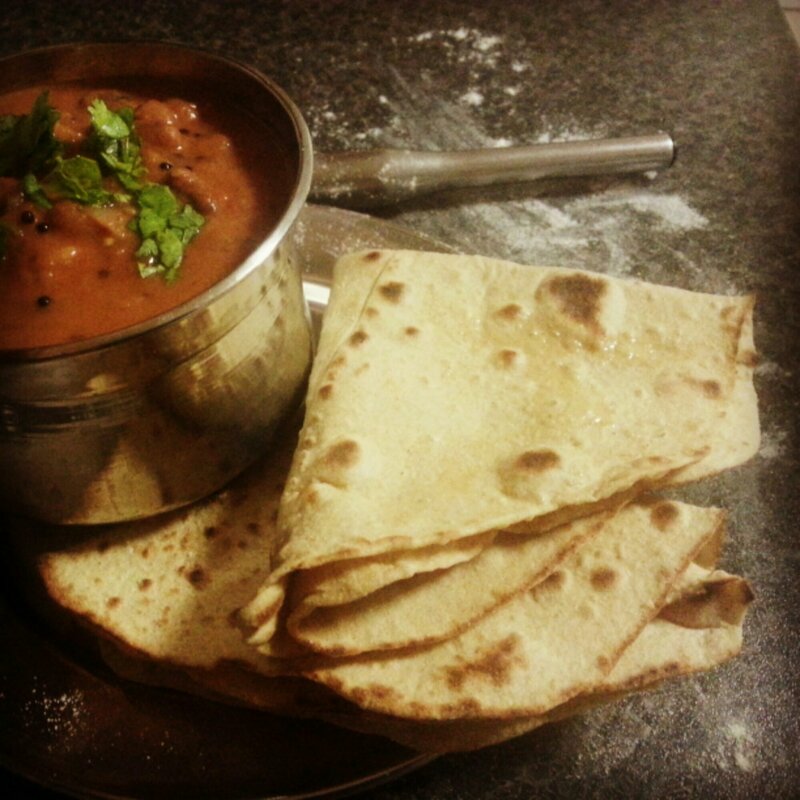 The photo shows my Roomali roti’s served with black eyed beans curry (aka Lobiya in Hindi & Kaaramani in Tamil).